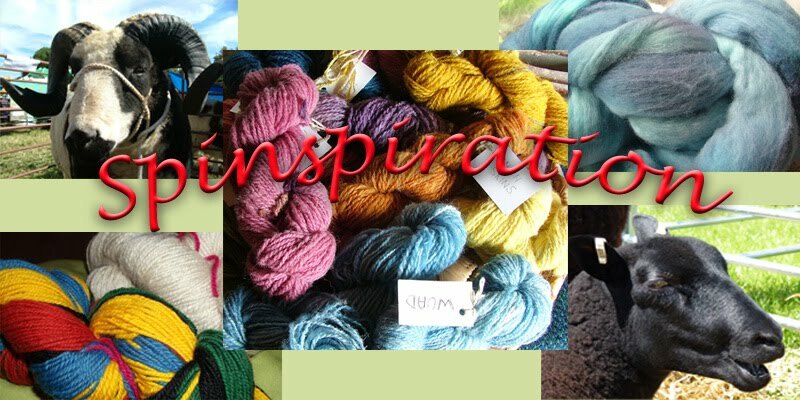 Spinspiration: Woolly Wednesday - Dawn's adventures with wool this month! 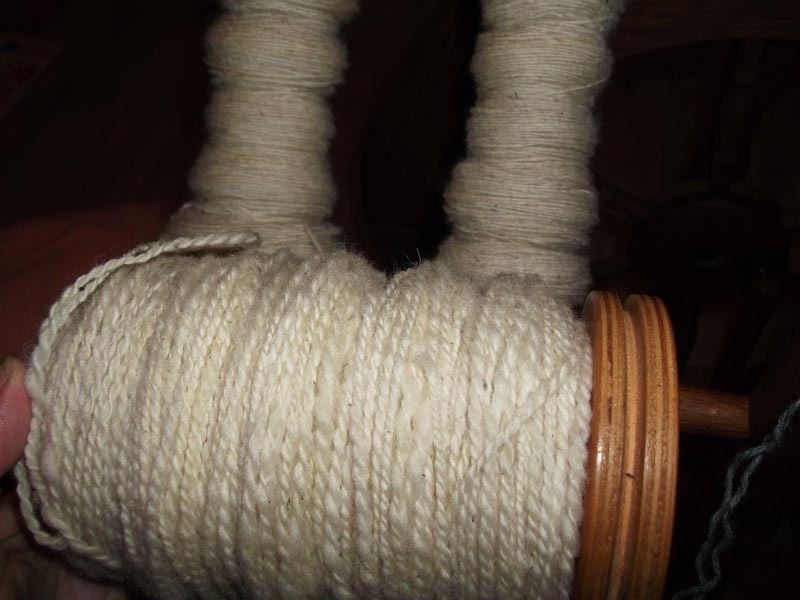 Woolly Wednesday - Dawn's adventures with wool this month! 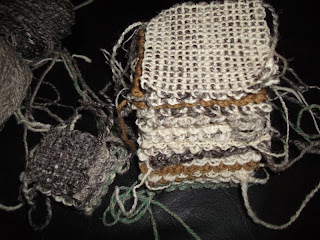 As Autumn approaches there are usually more woolly projects creeping in for those cosy dark evenings. 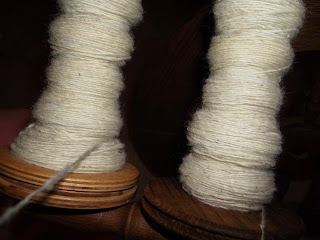 So as that time approaches here, I've got a few different things started or in mind - some knitting, some felting, some weaving and of course more spinning. So what about the last month? 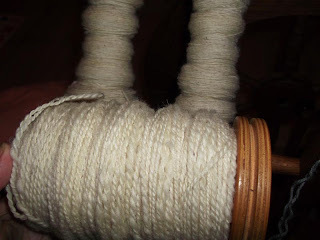 Well I've been mainly spinning Dorset Horn fleece this month, in amongst lots of Summer fun with Imogen being at home for the school holidays. So not much to share this month but here are a few pictures of the Dorset which has carded so nicely - this beautiful fibre just pulls wonderfully from the rolags to the bobbin, almost effortless, here are pictures of the singles I've spun and the two singles plied on the bobbins. 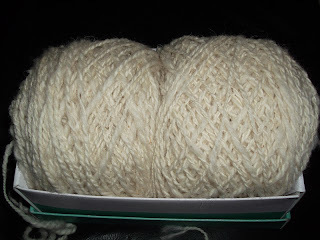 I've had a request for handspun house socks for a Christmas present so these I have cast on and am trying a new method for me - knitting two socks at the same time on a long circular needle. I have done the leg so far and about to start shaping the heel. 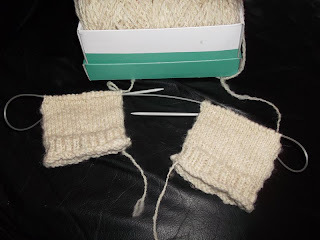 It seems a simple method and avoids that problem of knitting one sock and not getting around to knitting the second - I like that! Shoeboxes are useful for holding two big balls of handspun wool! 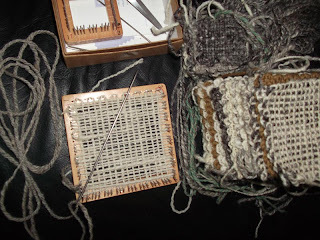 My other main project on the go at the moment involves weaving on a hand held weavette frame. I picked these up on the Guild sales table last year and have enjoyed making these ever since. Some have become rugs for my daughters dolls house, others have become other playthings. These frames are so much fun and easy to use - I can whip one of these up in no time. 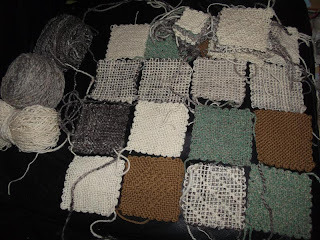 This little pile is for a seat cushion/pad to make sitting at Guild meetings more comfortable. 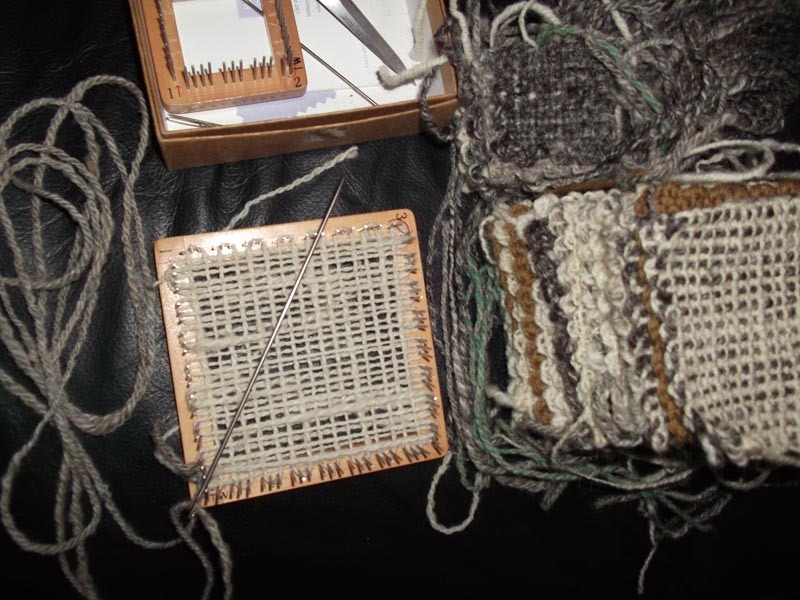 Our Guild like many has a yearly challenge and this years was to make a cushion for the seats. So these have been made with my handspun yarn oddments and a couple of other 100% wool yarns I have too. I think I shall try and make enough so it is all from my handspun yarn and use the others for something else. So that's what's keeping my fingers busy this month, how about you?